Well, today, I was awakened by a phone call telling me I was in the newspaper. 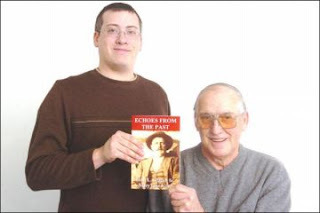 It wasn't entirely unexpected since I have been waiting for an article to appear that offers some details regarding my father's book, Echoes From The Past, the book that started my publishing company. Read the article. With press and publicity comes a new step in this whole new business process. We are gearing up for it, but there are always reasons for some nervousness. Founders House is a dream for me since I've has always been interested in publication. Now, I have the opportunity to do it my way. I get to see if I can create a new vision of book publishing that both pays homage to what has gone before, but hopefully, forges a new creative path in the industry. Is this ambitious? Yes, it is. But, I'm ready to give it my best shot. If you have any questions, please send them to me. I'm anxious to hear your input.